Why Counting Gunshot Victims In Las Vegas Is Challenging : Shots - Health News Doctors and emergency officials are still trying to figure out exactly how many people were shot in Las Vegas. The wide range of injuries and the sheer number of people injured are challenges. Carmen Algeria, a survivor of the mass shooting in Las Vegas, was admitted to Sunrise Hospital. 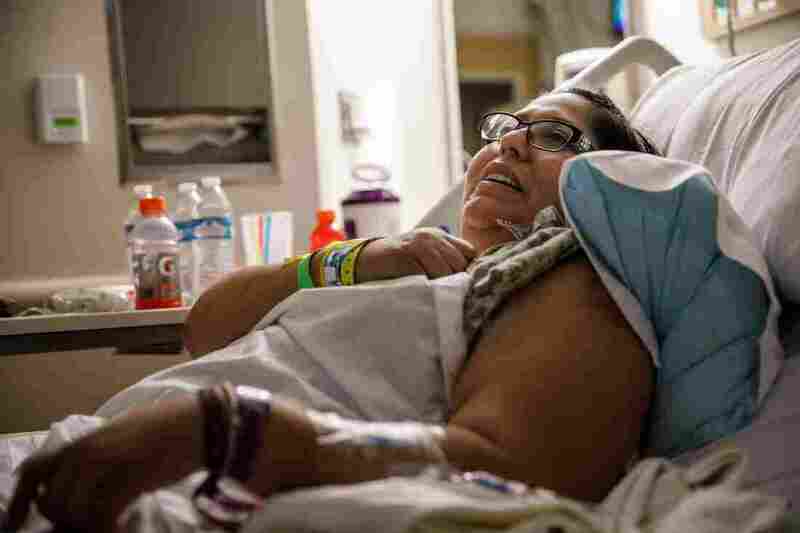 She had been shot in the leg and on Oct. 2 was awaiting surgery. Dr. Christopher Fisher was working at Sunrise Hospital and Medical Center just off the Las Vegas strip on Sunday evening when the patients starting arriving. "It did look a bit like a war zone, can't say that it didn't," he remembers. "Frantic families, blood in the hallways." People came in so grievously injured and so many at a time that Fisher, who is the medical head of trauma services for the hospital, and his colleagues used markers, writing directly on patients, to do triage. When someone arrived, an emergency room physician would mark their wounds. It was quick, simple and impersonal by necessity. Fisher says in those first few hours, the patients were functionally anonymous to the surgeons trying to save their lives. "There's no paper charts prepared for all those patients," says Fisher. "No documentation, so literally they just write on the patient. Just write where the wounds are." Fisher did seven surgeries in about 12 hours. "What stuck out to me was probably my first patient of the night," Fisher remembers. "I literally didn't even meet the guy, see the guy's face. He was just on the operating table, ready to go when I walked in the room." The man had been shot in the abdomen. Fisher's job was to find all the damage the bullet, or bullets, had done. And a bullet does terrible things to a body. "It tears the tissue, it rips the tissue, it bruises the tissue as it goes through," says Fisher. That first patient made it through surgery. As Fisher worked, he saw people with wounds all over their bodies. "Literally everywhere," he says. "We had people shot in the head, shot in the spine, chest abdomen, extremities." The gunman fired from above, and from a distance, into a crowd of about 20,000 people and "a lot of the gunshot wounds went side to side, so you anticipate that people were either running away or ducking." This is where, in addition to the controlled chaos of triage and the sheer volume of patients, the counting of gunshot wound victims gets even more complicated. At other Las Vegas hospitals, such as St. Rose Dominican, people came in with scalp lacerations where bullets grazed their heads. Others came in with a range of injuries from shrapnel, from bullets striking objects near them. Those types of injuries may or may not have been labeled as gunshot wounds by emergency room staff. And even counting the total number of people treated at any given facility is challenging. For example, Clark County Sheriff Joseph Lombardo revised the estimate for the total number of people injured, from about 520 down to about 500, saying some people had been counted twice initially. Meanwhile, some suburban hospitals in the St. Rose Dominican network said they were still receiving some patients who were seeking treatment for the first time after being injured in the shooting and initially going home, rather than checking into the hospital immediately. For the major hospitals, it has taken days to do their own counting of patients and cataloging of injuries. A spokesperson for University Medical Center, the only Level 1 trauma center in the city, said Tuesday night that it was unclear how many patients the hospital had treated specifically for gunshot wounds.